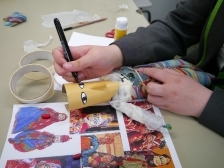 Start, created by Children & the Arts, is a three-year engagement programme of arts activity between cultural organisations and local schools that tackles inequality by working only with the children who need it most, who are at risk of missing out on a creative and cultural education. It has been running nationally for 10 years and has involved more than 130,000 young people aged 4-16 years old. The programme is proven to raise the aspirations of young people, building confidence and helping with learning and development in school. Start at Rosehill Theatre is exploring the heritage of Rosehill and its unique connection with Oliver Messel, a 20th Century British theatre designer and the designer of Rosehill’s Grade II listed auditorium. In year two we are working with Whitehaven Academy, Moresby Primary School, Montreal Primary School, Arlecdon Primary School, Thornhill Primary School and St Bega’s Primary and our focus is costume and character. Students will attend performances at Rosehill and Theatre by the Lake in Keswick to see different types of theatre design in action. They will take part in drama workshops to bring characters to life and visual art workshops to develop their critical eye, have fun creating their own costumes, and share their achievements with each other at the celebration event later in the year. This project is supported by Children & the Arts Foundation and Curious Minds and delivered in partnership with Theatre by the Lake.